The Boletus Edulis is a well known fungus that grows wild in the woods, and was always a substantial economic resource for Berceto. All these mushrooms are excellent fresh or dried, with the inevitable small differences in color, taste or smell, due to the substrate, to share and plant essences with which live in symbiosis. Delicious and tasty are pasta dishes based mushroom, such as tagliatelle and risotto dishes. Even the scaloppine of veal with mushrooms are a refined dishes. But if you want to taste the mushroom in its full flavor recommend it grilled or breaded and fried. 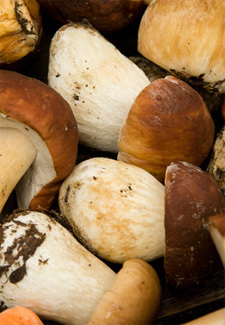 Il Boletus Edulis Prized as an ingredient in various foods, B. edulis is an edible mushroom held in high regard in many cuisines, and is commonly prepared and eaten in soups, pasta, or risotto. The mushroom is low in fat and digestible carbohydrates, and high in protein, vitamins, minerals and dietary fibre. Available fresh, in Italy, from the end of spring to the end of October, it is most often dried, packaged and distributed worldwide. The Boletus edulis also produces a variety of organic compounds with a diverse spectrum of biological activity. The standard Italian name porcini means "piglets" in Italian, and echoes the term suilli, literally 'hog mushrooms', used by the Ancient Romans, and still surviving in Southern Italian words for this mushroom. It is well known from the Borgotaro-Berceto area of Parma, Italy, and has PGI (Protected designation of origin) status there. The Boletus Edulis mushrooms, stars of Risotto dishes and Grilled dishes with typical local specialities. 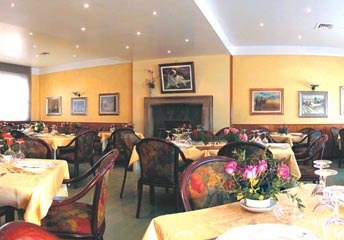 Our Restaurant proposes every weekend, three different menus and two overnight stay in our hotel. A winning formula to enjoy our typical products according to the season, taste our fine wines without having the hassle out of driving because we also offer you a confortable room to rest in a quiet atmosfere. The Hotel Vittoria Ristorante Da Rino, located in Berceto, along the route of the ancient Via Francigena in the Parma Apennines, offers its guests enchanting weekends in a land rich in culture and history, with a high level culinary heritage even though rustic and traditional. The Hotel Vittoria Ristorante Da Rino offers exclusive gastronomic events, tasting fresh mushrooms dishes accompanied by fine wines from Arola and overnight stay in double room with breakfast included.